Did you know that as a nation we only grow 40% of our own food (and only about 5% of the fruit sold in the UK)?! That means that we import the rest from all over the world. Down to Earth Stroud feel that it is about time more people were afforded the opportunity to regain control of their own food supply, especially with a looming oil crisis, an increasing population and the economic crisis that has left so many struggling financially! Amongst our many projects are the Fruit Exchange, the Stroud Community Seed Bank, the Selsley Community Growing Scheme and the Vale Community Hospital Allotment Scheme. You can read all about these here on our website and see our updates on our blog. 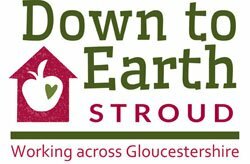 Down to Earth (Stroud) Ltd. is a Community Interest Company. Registration No. 8836484. Find out what a Community Interest Company is here.